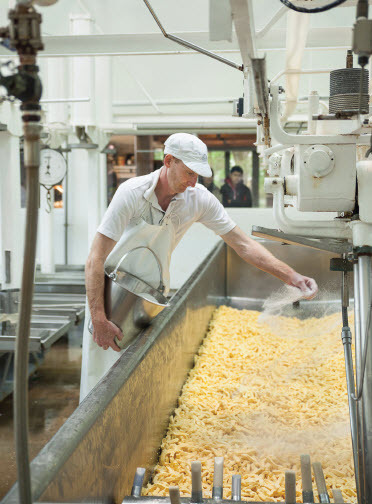 Fun facts about our cheese and the way we make it. Being left on the shelf is nothing to be ashamed of. Extra ageing of cheese allows big flavours to develop. We age our cheese on white pine shelves because white pine doesn’t impart any extra, unwanted flavours into the cheese. Crystals are the sign of a fine cheddar. If you discover a crystal-like substance on the surface and inside your aged cheddar, don’t be alarmed. This is a good thing and a natural consequence of a well-aged cheese. It is caused by the calcification and crystallisation of milk sugars. How to best eat a true blue. Next time you feel like eating blue cheese, leave it out of the fridge for at least two hours. Even though our Peninsula Blue has already spent a good amount of time ‘blueing up’ in our blue room, it tastes even better at room temperature. Never underestimate a cheese cutter. A cheese cutter’s job is to hand cut a wheel of cheese into pieces that are the same size and weight. A simple enough job, you would think. But not all cheese wheels are the same – they can vary in weight by up to 3kgs, which means the cutter is always having to adjust the cut. How to settle a cream compromise. To make our Havarti extra creamy, we hand skim the cream off the top of the milk used to make Edam, then add this to the whole milk used to make Havarti. This is also why Edam is lower in fat than other cheeses. What makes the many holes in Maasdam? Actually, they’re called ‘eyes’ and are the result of a secondary fermentation process. Maasdam wheels are placed in a room where the temperature is raised to 16 degrees. This causes small explosions in the cheese wheels, which form the eyes that are characteristic of this style. Once they are fully ‘blown’, the wheels are coated in wax.